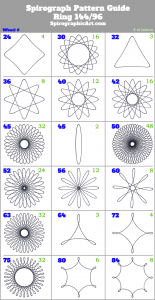 In case you’ve lost the cover of your old Spirograph set, or the booklet showing the patterns, or maybe you’ll just find this handy, I’ve re-created the pattern guide showing the patterns created by Hole #1 of each of the Spirograph wheels inside each of the two rings. You’ll find it in the menu under “Reference section”. It was under “math” but maybe that’s too off-putting and people won’t look there. The reference section also has tables showing the number of points made by any combination of teeth. There are other nerdy, technical posts that I’m collecting under the same banner. Some people will go for the math and others will be repelled. I just want you to find it if you need it.